Too often we look at documents as just pieces of paper or digital files that contain information. We often forget to consider the value of that document. Some documents are assigned value based on time to write (like a very large document) or potential fines if done wrong (like a regulatory or compliance document). But every document has some value. Looking for an event that actually delivers what it promises? Observation #1: There are a lot of very cool content, records, and information management products and companies out there. Observation #2: I have seen this at the AIIM road shows. I ask a person from one of sponsors to give a 60 second pitch on what makes them unusual in the marketplace or on what unique value they deliver. Keep in mind these are usually sales and marketing people. Panic immediately ensues. Eyes of potential customers glaze over. Observation #3: We spend far too much time in our industry talking to ourselves. Opportunity: Create a 60 second or less elevator pitch on your company or product. Send it to me. You will likely need to do so via something like YouSendIt or DropBox or Box.Net to get around file size limits. Use this email -- jmancini77 at mac.com. I will post it, on this blog and on a special new blog if I get enough submissions. If I get enough critical mass, I will conduct a contest later this summer to determine the most effective submission. The rules for this contest will be very subjective and arbitrary and announced at a later date. Fine Print #1 (no exceptions): Your company must be an AIIM trade member. Email Amy Michalski to find out if you are or to find out how to become one. Your submission MUST BE 60 seconds or less. Your submission must be recorded in an actual elevator. Fine Print #2: Have FUN. Remember, our industry does not by definition have to be boring! We provide tools to help organizations do great things. 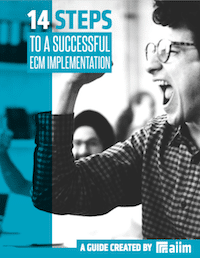 I have been describing our journey to an ECM solution for years. The description usually goes something like this: “we have made good progress in several small areas but we have yet to attack the really large targets.” Recently, we engaged what I feel is our first truly difficult ECM task. Below is a quick summary of the lessons learned leading up to this point. John Keadle has operated ShannonNet.com since 1999 supporting business management and eCommerce solutions. In addition to his work with some of the largest solution providers in the world he has contributed to a number of books covering SharePoint and ERP systems. He currently works as the Director of Program Management at International Computer Concepts, Inc (http://www.ICCINet.com) in Raleigh, NC. He blogs at 14Hive.org and you can follow him on Twitter: @ncjks.